It’s the start of another year and a very good time to reflex on the one that’s just passed. For The Tricycle Collective, we have been honored and fulfilled in achieving more work than ever in our efforts to keep Detroit families in their homes. In this year alone, we successfully raised $30,000. Of this, we contributed over $28,000 to more than 50 families across Detroit, to enable them to own the home they already live in. In total, we’ve helped sustain the homes of well over 200 children across the city. Some of this year’s highlights were the incredible events we hosted. If you missed them, check out a video from our storytelling event featuring testimonials from members of The Tricycle Collective whose homes have been sold at auction. A lasting piece of beauty was created in a mural collaboration with 1xRun and The Tricycle Collective. 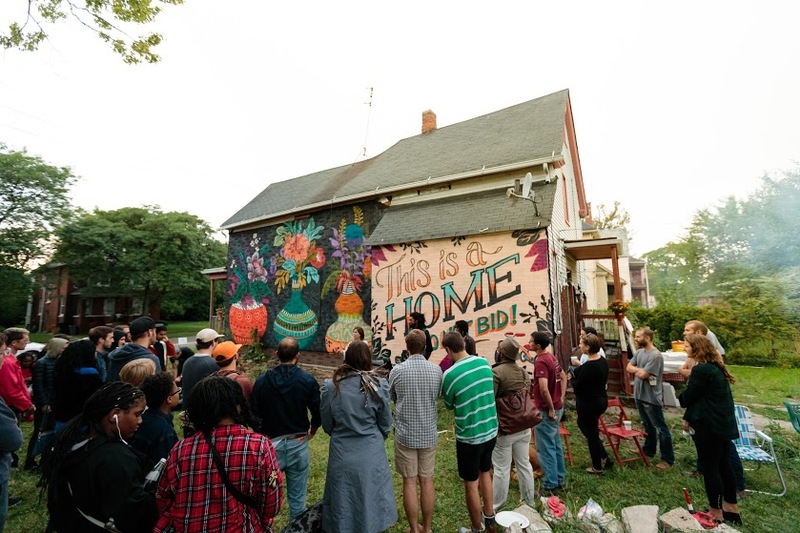 Local artists Ellen Rutt, Ouizi and Jonny Alexander created a spectacular mural featuring the plea “This is a Home Do not Bid” to raise awareness about the many occupied homes being sold across the city. See photos here. We hosted a community event to help Tricycle members reassess their property values and make sure they had basic homeowner paperwork in order, and we continued to share information and education through web posts, social media, and letter-writing. We are honored to have the support of our community to do this work. All of our efforts are done on a volunteer basis, and we depend on direct donations from individuals and local organizations to fund the work and the donations. In the coming year, we pledge to continue to be good stewards of our community’s generosity, and to do our part to Keep Detroit at Home.